This 3.5 lb. 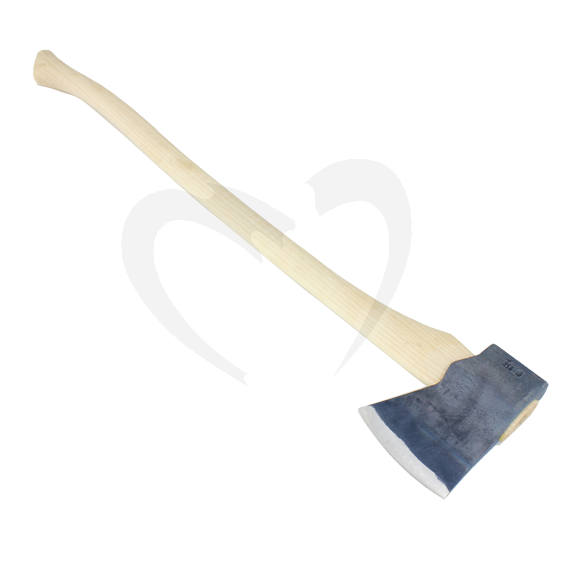 Jersey pattern single bit axe with a 36" curved handle from Council Tool is a full sized felling axe for general axe chores. The hand sharpened, tapered bit is ideal for cutting and splitting. Sometimes referred to as a "Baltimore Jersey" pattern, the head shape features lugs or ears which increase the surface contact area with the handle. The geographic origins are self explanatory. The earlier Kentucky and North Carolina patterns were somewhat similar. Cutting edge is approximately 5" in overall length and the poll is square. Forged tool steel head. Made in the USA. - ANSI Standards call for bit hardness of Rc 45-60, at least 1/2" inch back from the cutting edge. Council Tool internal standards call for tempered bit hardness of Rc 48-55 and targets 1-1/4 inches from the cutting edge. - The poll and eye walls are not hardened and remain in the as forged condition. - Head coated with boiled Linseed Oil over the as forged finish. - 36″ curved American hickory handle. Eye section is dried to below 10% moisture content to minimize shrinkage and help prevent loosening. Hafted high and proud. - Axe head is hydraulically seated onto handle and secured with a traditional double wedge system. - The interior detail of the eye is tapered and allows for a strong mechanical bond. Approximately 1/4″ of overall length of the handle is removed during assembly.